Michele Fitzgerald was raised in rural Martin County, North Carolina. She started painting at the age of fourteen after discovering the meager art supplies section of the local Walmart. She continued painting in her spare time throughout high school and college. In 2005, she graduated from the arts conservatory, UNCSA, with a BFA in Filmmaking before moving to Los Angeles to pursue her dreams. She experimented with many styles and mediums over the next twenty years, honing her individuality, and turning what was once just an adolescent hobby into a meaningful endeavor of study and practice. In 2014, she fashioned her nom de guerre from her childhood and adult nicknames and Micki Fitz was born. That same year she began working seriously on the Starlight Curio series of old Hollywood and pop-culture collages. In 2016, she began her abstract work in earnest with a series of heavy “texturescapes” made up of gel, polymer clay, and other objects. More recently, she has created pieces made up of acrylic and spray paints. 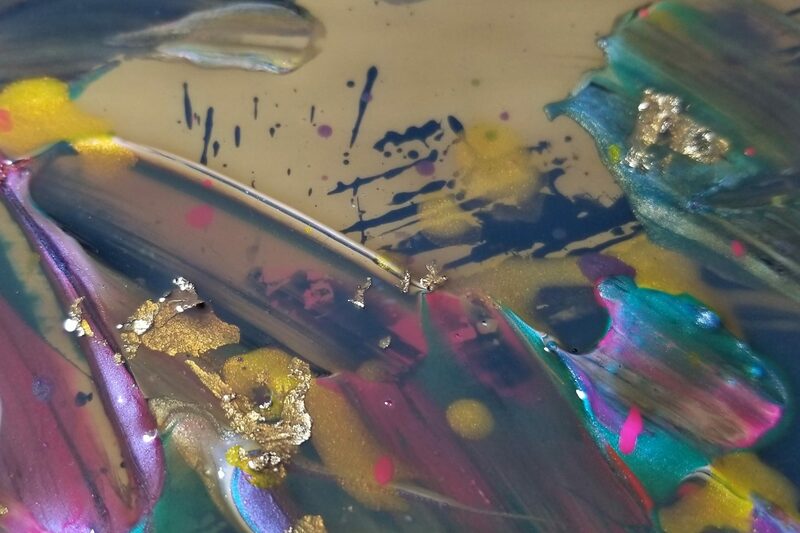 These combine with nail glitters, metal leaf, and other material to create wild, sparkling compositions of complex colors schemes often obscured by a veil of tobacco-stained polyurethane. Michele lives and works in El Segundo, CA with her roommate and a lizard named Chainsaw. That is the one-line Instagram bio that I wrote when I started my abstract work. It was a sentence that popped into my head when I was creating the account and so I went with it as a weird joke about what I felt like I was doing at the time. Since then, it seems like that little sentence becomes more exact every day. I am the exhausted owner of a very overactive imagination and I spend a lot of time in my own head, dreaming, philosophizing, conversating. My work is very much a product of that wild introvert lifestyle. Each piece reflects some part of who I was in the combined moments of its creation, my moods, obsessions, and whims. My hope is to get viewers to wade through the gummy tar of each canvas and explore it over time. No two square inches are the same. You can see something new every time you look at them and if the nonsensical titles get a smile or a laugh, well then, I’ve done my job. I’ve brightened a little moment of someone’s day and connected with a stranger across the gulf of the Universe and I think that’s pretty freaking great.